Joel Rafael is repurposing his song "Strong," a collaboration with Jason Mraz premiering exclusively below, as part of his upcoming album Rose Avenue for all the right reasons. California singer songwriter Joel Rafael will release his tenth album, Rose Avenue, on June 21, 2019 worldwide on Inside Recordings. Rose Avenue gracefully defines Rafael and his contribution to the American canon. The ten-song masterpiece includes nine originals that reflect the honest accounting of a man in his 70th year. The album will be available for preorder beginning Friday, April 19, on Inside Recordings, a label created by Jackson Browne and his management team that is distributed by Alternative Distribution Alliance. 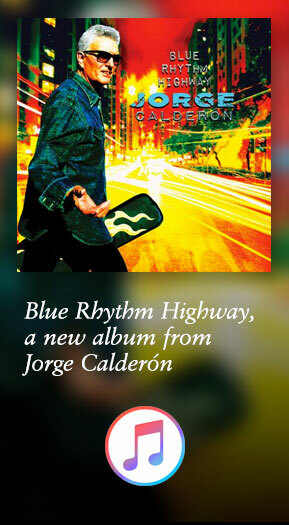 Inside Recordings announces the release of Blue Rhythm Highway, from GRAMMY-winning musician, singer, songwriter and producer Jorge Calderón. The album is Calderón's long-awaited follow-up to his first solo album, City Music, in 1975. Blue Rhythm Highway is available today worldwide via Amazon, iTunes, and through all digital and physical retail outlets. Singer Songwriter Jackson Browne releases a new video and single today, December 15, 2018. The Dreamer (featuring Los Cenzontles) is released on Inside Recordings and distributed worldwide thru Alternative Distribution Alliance (ADA). 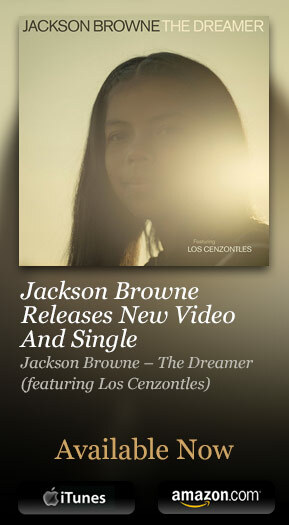 The Dreamer was written by Jackson Browne and Eugene Rodriguez of Los Cenzontles, and performed by Jackson, Los Cenzontles and David Hidalgo (Los Lobos). The video was directed by Mark Kohr (Green Day, No Doubt, Primus, Shakira). Joel Rafael is a disappearing breed: a Guthrie-Dylan-Llewyn Davis-style folk singer and Vietnam draft-dodger armed with a harmonica rack and acoustic guitar, who sings tales of love and history flickering with ache and political outrage. His ninth LP is unfussy and modestly heroic, drawn in clean fingerpicking laced with Greg Leisz's laidback pedal steel. Rafael has a weathered, fragile survivor's voice that fits his material; lyrics are plainspoken, sometimes to a fault. The strongest tracks are "El Bracero," about the hypocritical legacy of U.S.
Ayant commencé sa carrière sur le tard, le guitariste américain n'en est pas encore au stade de l'angoisse de la page blanche. Critically acclaimed, California songwriter and seminal folk artist Joel Rafael releases his ninth album today, Baladista, on Inside Recordings. Inside Recordings, a label created by Jackson Browne and his management team, is distributed worldwide by Alternative Distribution Alliance. 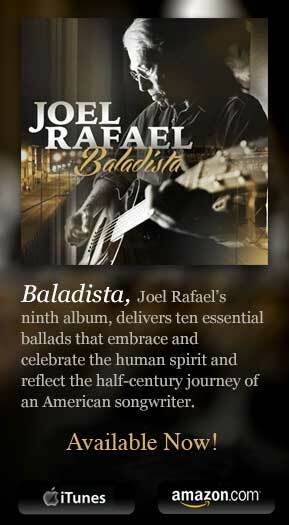 Baladista is available today at all normal retail outlets, including Amazon and iTunes. Acclaimed singer-songwriter's new album, Baladista, due out April 14, 2015. Il 14 aprile torna l'acclamato compositore californiano e artista fondamentale della musica folk con "Baladista", nono album in studio in uscita su Inside Recordings. Joel Rafael pubblicherà il 14 aprile su Inside Recordings il suo nono album in studio dal titolo Baladista. La Inside Recordings è l'etichetta creata da Jackson Browne e dal suo management. Browne confirmed his place as an essential voice in the wilds of the 21st century with this powerful set of songs about love and progressive ideals – forces that a corrupt world can never truly defeat. Songs like "The Long Way Around" are the most eloquent protests against apathy you'll hear this year. "Tras los pasos de Woody Guthrie. 'No tengo dinero, llevo canciones en el corazón', escribió Jack Tempchin en su primeros tiempos con Funky Kings y que cantó Joel Rafael en su penúltimo disco. Canciones son sueños, ilusiones, historias que nos conmueven de este trovador ambulante de San Diego, California, aunque nacido en Chicago. Joel Rafael, discípulo aventajado del legado y de las enseñanzas de Woody Guthrie, nos visita como parte de su amplia gira española. Jackson Browne’s new album is a masterclass in Americana says Harry Mulligan. Singer and songwriter Jackson Browne remembers the circumstances well: Just 18 years old, with $50 to his name and new to New York City, he "lucked into" a job playing for the singer Nico. Suddenly he was an observer to the world of The Velvet Underground, Andy Warhol and their coterie. The legendary songwriter about his politics, his fourteenth studio album and what it was like the first time he saw Springsteen perform. MOJO - Stream Jackson Browne’s New Album! A sort of jammy, friendly kind of arrangement is at the heart of it. 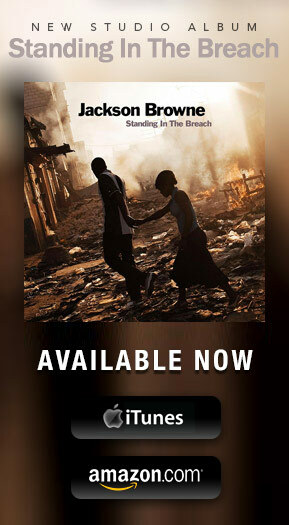 You notice something very striking about Jackson Browne when listening to his new album, Standing In The Breach. Beyond its myriad, rich and sublime attributes – the dreamy bed of Byrds-like guitars on The Birds Of St. Marks, the spellbinding transposition to song of an unpublished Woody Guthrie letter, along with Browne's engrossing examinations of human bonds and social-political concerns – there's the singer's sweet and soulful voice: It's as pure and present as it's ever been, an instrument that is, it would seem, ageless. RTVE.es estrena este martes Standing in the breach, el décimo cuarto disco en estudio del cantautor estadounidense Jackson Browne. Standing in the breach, que verá la luz el próximo 7 de octubre, es un trabajo "con rasgos claramente personales y políticos, donde explora en profundidad temas como el amor, la esperanza y desafía de cara algunas de las incertidumbres que acontecen en la vida moderna", según la nota de prensa que acompaña al lanzamiento. Hören sie bei uns vorab und exklusiv das neue Album von Jackson Browne: "Standing In The Breach". Standing in the Breach, the new Jackson Browne album premiering at USA TODAY (out Oct. 7), finds the singer/songwriter in a distressed but ultimately hopeful frame of mind. Take the key line in If I Could Be Anywhere: "If I could be anywhere right now, I would want to be here." It's a lyric, and a delivery, worthy of Browne's most sentimental love songs, but it's not used that way. Except that it kind of is. With Standing in the Breach, Jackson Browne makes a stunningly bold statement of purpose in a moment that might have been more reflective. After all, his very best music was the subject of a celebrated recent tribute album, something that might have left a lesser artist more humbled than ambitious. Not Browne. His first album of new songs since 2008, set for release on Browne’s own Inside Recordings in October, finds him working at peak creativity — as a writer, as a performer, as a bandmate. USA TODAY music critic Edna Gundersen highlights 10 intriguing tracks found during the week's listening. Written in 1967 while Browne was playing guitar with Nico, the world-weary Byrds-inspired ballad is on Standing in the Breach, out Oct. 7. Browne wrote this ballad in 1967, when he was 18 and returning to California near the end of his period in New York playing guitar with Nico. He recorded a demo in 1970, but he’s finally officially releasing the song on his new LP. Against gentle Byrds-like guitars, he adds decades of wisdom to its prayerful weariness. On October 7th, Jackson Browne will release his 14th studio album, Standing In The Breach. The album was recorded in Los Angeles and features the single "The Birds Of St. Marks," which debuted yesterday on Rolling Stone and MOJO. Jackson Browne Returns to an Old Favorite Hear "The Birds of St. Marks"
Six years after Time the Conqueror, a Bush-era LP that found him addressing subjects like Hurricane Katrina and the Iraq War, Jackson Browne is preparing to release Standing in the Breach, a new studio album due October 7th. For the lead single, the singer-songwriter returned to "The Birds of St. Marks," a tune he wrote when he was playing guitar with Nico in the late Sixties, and recruited his new ensemble of musicians to give the track a fuller arrangement. Inside Recordings announces 40th anniversary reissue of Jackson Browne’s Late For The Sky. Remastered and available worldwide on June 23/24. Presented in new eco-packaging and an all digital format. Jackson Browne Solo Acoustic tour dates are currently on sale. The new CD/DVD set is entitled Woody Guthrie at 100! Live at the Kennedy Center, but in fact, Woody never made it past 55. This document of an altogether lively concert program from a wide assortment of admirers proves, however, that his music has not only lasted 'til 100, but will likely survive us all. This is a celebration, yes, but a celebration with a conscience. A strong thread of morality and social awareness ran through all of Guthrie's songs, as he believed music could make a difference in America. Inside Recordings will release Jackson Browne - I’ll Do Anything: Live In Concert DVD on June 18, 2013 with worldwide distribution through ADA. California songwriter and seminal folk artist Joel Rafael was awarded the top prize in Folk/Americana/Roots at 2013’s International Acoustic Music Awards for his recording of “Dance Around My Atom Fire,” a song he co-wrote with Woody Guthrie. The 9th Annual IAMA’s were announced on Monday, February 4th. Judging is based on excellence in music performance, songwriting, composition, song choice, music production, originality and artistry. GRAMMY-winning musician, vocalist, songwriter and producer Jorge Calderón will make his song, “I Will Wait For You” available for free download via his website today, Monday, November 26th. GRAMMY-winning musician, vocalist, songwriter and producer Jorge Calderón will release two new singles on Inside Recordings Tuesday, October 30th. "I Will Wait For You" and "Thorn In Your Side" will be released digitally via Inside Recordings - an independent label founded by Jackson Browne and his management. Join us for live performance featuring Joel Rafael performing songs from his new CD " America Come Home" and talking about Woody Fest from our New York studios. Channel 740 internet only. Stay up to date with the latest news, "like us" on Facebook and "follow us" on Twitter. In addition, if you read a story that you love and want to share with everyone, we’ve made it easy to spread the word with share/save buttons located at the bottom of each post. Spinside Records is home to emerging artists from a range of genres, including electro-pop, dance, trance, retro-funk, hip-hop, indie rock, and electronica. The artist-centric imprint is a new division of Inside Recordings, the independent label formed by Jackson Browne and his management company.